In the Fall semester of 1994, Tim Becker, CB, Randal Nelson, Jonas Karlsson, and others ran a course in robot building, based on the Jones and Flynn book. It was a graduate course, and will migrate to the UG curriculum with the advent of suitable laboratory space, presumably linked to our starting a CS major. We had a ping-pong ball delivery contest and a lot of fun. A Meccano version, along with a view of the robot arena. 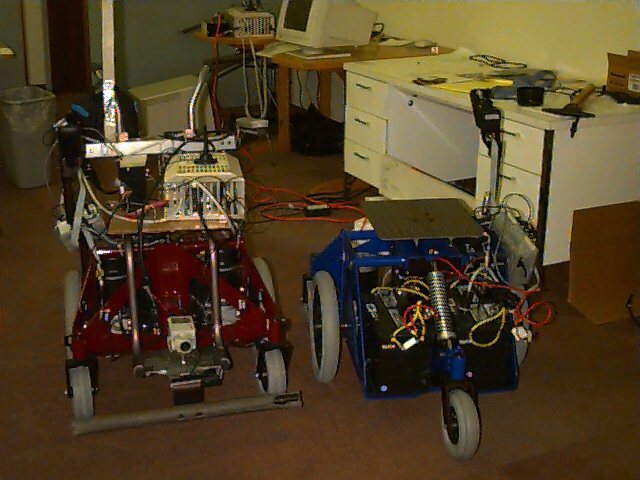 The course, the competition, and the robots are all described in an upcoming UR Technical Report. The Computer Science vision, robotics, virtual reality and psychophysics laboratory is designed to support research on anthropomorphic robotic systems, human-machine interaction, and human performance. It currently consists of the following components. An ageing binocular head containing movable cameras for visual input. A new binocular head with computer controllable focus, aperture, and zoom. a 16 degree of freedom Utah dextrous manipulator or hand. two robot arms that can support and move the head and hand. ExOS, Dataglove, and Flock of Birds devices for digitizing hand and joint positions (human and robotic) and teleoperation research. an aging special-purpose pipeline parallel processor for high-bandwidth low-level vision processing. A new video pipeline (Max200). General-purpose MIMD parallel computation (8-node SPARCcenter 2000, 12-node SGI Challenge). SGI Crimson processor dedicated to graphics and virtual reality, with GTX graphics hardware. Binocular virtual reality helmet, specially modified to include eye-tracking capabilities inside the helmet. Instrumented ``car'' (a go-kart frame) with outputs from steering wheel, accelerator and brake position. A head-mounted eye-tracking device (including A Flock of Birds sensors for head and hand position). It is an Applied Scientific Laboratories Series 4000, with the helmet and head-tracker option. It can track eye movements in head coordinates, and in conjunction with the Flock of Birds head position sensor it can quantitatively track gaze directions in LAB coordinates. High-quality 8mm editing tape deck for recording eye-movement data. A block diagram of the lab shows (approximately) the current hardware and its connectivity. In its default configuration, the binocular head has two movable color CCD television cameras and a fixed color camera providing input to a MaxVideo pipelined image-processing system. (Computer controlled focus and zoom, and black\&white cameras, are options). One motor controls the tilt angle of the two-eye platform, and separate motors control each camera's pan angle, providing independent vergence control. The controllers allow both velocity and position commands and data read-back. The main feature of the camera controllers is their speed. Camera movements of 400 degrees per second can be achieved, approximating the 700 degrees per second speed of human eye movements. The dextrous Utah hand is a four-fingered, 16-DOF, tendon-driven, pneumatically-actuated manipulator that allows us to do sophisticated manipulation. It is driven by the SPARCStation2000. Click on the thumbnail for a bigger image of the hand and head. The hand is maneuvered by either a PUMA761 or PUMA760 six degree-of-freedom arm, each with a two meter radius workspace and a top speed of about one meter/second. They are controlled by a dedicated LSI-11 computer implementing either the proprietary VAL execution monitor and programming interface or the public-domain RCCL controller. The MaxVideo pipelined image processing systems consist of several independent capabilities (on separate boards in the old system, integrated on one board in the Max200), which can be flexibly linked together to achieve a wide range of frame-rate image analysis capabilities. The MaxVideo boards are connected by VMEBus to Sun workstations and the SGI parallel computer. An important feature of our laboratory is the capability to use a multiprocessor as the central computing resource and host. Current multiprocessors are so fast that they rival the performance of special-purpose frame-rate pipelines. Further, they allow the true asynchronous parallelism that is necessary for simultaneous and cooperating motor control and visual sensing. The main multicomputer resource is a SPARCstation 2000 with eight processors, but an 8-processor SGI has digitizing and framestore capabilities and is also used (in conjunction with the ethernet and a SPARCstation) for sensori-motor control. 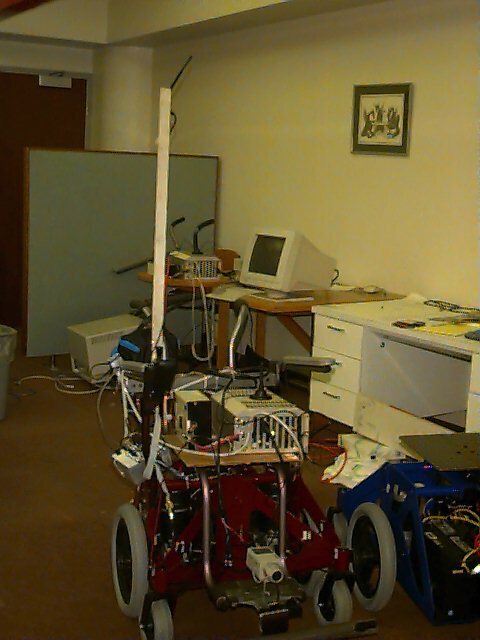 Both Wheelchairs: we are improving the odometry on one.